Phobos Et Deimos is a flag on the Cerulean Ocean originally of the Midnight Ocean. It was founded on 10 December 2006. Just before Ostreum VIII, the earliest seeds of what would become Phobos et Deimos were planted. The idea, discussed between Galrion and Evilgohan of Angels Forbid, Peglegpaul, Ooriki, and Queequag of Dioses Y Demonios, and Drakulic and Armageddon of ARR, was the creation of a large flag made up of veteran crews seeking to re-energize interest in flag activities and have a large pool of experienced pirates available for pillaging. The three crews would work together for the first time, albeit unorganized, at Ostreum VIII. Superlemon Krakatoa put up a token defense but did not seriously contest the blockade, all but conceding the island to Elysian Fields when it was obviously The Pack could not defeat Elysian Field's superior numbers. Angel's Forbid and Superlemon Krakatoa both wanted to retake the island, and this issue would be the driving force in Phobos et Deimos's early weeks. A number of names were debated for the name of the new flag, most of them vehemently shot down as anything related to "destiny" or "legacy" was considered cliché. Queequag eventually suggested Phobos et Deimos, meaning Fear and Dread, and this encapsulated the general feel of what the three crews were looking for. 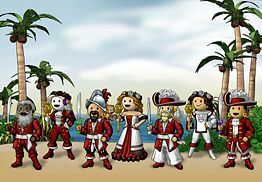 Dioses Y Demonios and Corporate Pirates, the two crews in Superlemon Krakatoa, combined into a single crew to preserve the SK name, and the three crews formally started the new flag on December 10th of 2006. Bnavking approached the fledgling flag soon after, and brought his crew, Bad Booty Pillagers, into the fold giving the flag its four initial core crews. Bootymoe and Moonsword's crew, Collateral Damage, was brought in to make that number five. Originally, the flag's politics intended each flag to have two royals and a rotating monarchy, where each crew would have a defined period with one of their royals as monarch. As planning for Ostreum IX was in the works, this was changed to have a permanent monarch whom would mediate the royals until he or she either stepped down or lost the confidence of the other royals. Debate on whom would admiral Ostreum IX went on for a few weeks. Misunderstandings between Collateral Damage and the rest of Phobos et Deimos led to both Collateral Damage leaving the flag and the decision to have a non-flag admiral for the blockade. The presence of two other blockades during the same day provided Elysian Fields with greater jobber support. During the final rounds of the blockade, Elysian Fields returned the war declaration, but even the loss of several ships wasn't enough to overcome Elysian Field's higher numbers. The decision was made to blockade again the next week with an in-flag admiral, Akaterini of Superlemon Krakatoa, with Adesh of Bad Booty Pillagers as co-admiral. With the war declaration still in effect, Phobos et Deimos would win the island in a brutal war of attrition, culminating in a grueling Round 2 which saw both sides sink high numbers of their opposition. Homiedirt of ARR was elected as the island's governor. The flag continued to grow and remained very active, holding the #1 rank for flag fame on several occasions. Bnavman's G's Pirateers joined briefly, and Reanimated's Acidic Children also came into the fold and remained. The flag also held a brief war with Blighted. Aftering hearing word that Cnossos was due to be blockaded by Cold Fire, many of ARR's senior officers requested that Phobos et Deimos take up the cause of defending Cnossos for Widows and Orphans. The royalty agreed that it was a worthy cause, and spent a frantic 40 hours trying to move ships and supplies to the island. Despite assistance from several of Cnossos's supporters, Cold Fire's superior numbers won the first round easily. After round two also ended in Cold Fire's favor, Bnavking made the decision to concede the blockade. A period of shifting crews came into play as Angels Forbid left the flag, returned, and then merged into Messier's crew Cod Help Us, which had also joined. Many within the flag were calling for a blockade after month long preparations for one without committing to a target. After a shuffle in the royalty, along with the departure of Cod Help Us, the flag made an attempt to take Islay of Luthien from Carpe Noctem. The date of the block coincided with an attack on Ostreum by Black Veil. After two contested rounds where jobber-support provided Carpe Noctem an insurmountable advantage, Luthien was conceded so that focus could be turned to the defense of Ostreum. The Widow Queen's attempt to take the island was repelled in three straight rounds. This page was last modified on 18 October 2016, at 11:47.